That's a slight exaggeration, depending on who you ask. 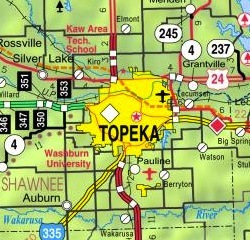 According to this report (also this one), no one is currently being prosecuted for misdemeanor acts of domestic violence committed in Topeka, Kansas, because of a dispute between the city and county over which of them should have to pay the costs. After county commissioners approved a 2012 budget that cut the DA office's budget by 10 percent, DA Chad Taylor announced that he would no longer prosecute misdemeanors committed in Topeka because his office couldn't afford it. The idea, apparently, was that if the county DA wasn't prosecuting these people, the city attorney's office would have to do it, so the county would save money. Good plan, Topeka replied, except we don't have any money either, so you'll have to keep doing it. We can't, said the county. While they squabble, alleged offenders are being sent home. The no-prosecuting policy appears to apply to all misdemeanors, but the September 8th release of 18 people charged with misdemeanor domestic battery has focused attention on that issue. Well, that, and the possibility that they might go home and commit more misdemeanors of that kind. Or worse. The city council now seems to have a plan to break the continuing deadlock, however. The county can't make them prosecute people in Topeka for something that isn't a crime in Topeka, you see — so to solve the problem, on Tuesday the council repealed the city's law against domestic battery. The thinking seems to be that the county will now have to go back to prosecuting these cases, but it's not entirely clear to me why that is necessarily so. It should, of course, but can the city really force it to do so? On the other hand, it's also not clear to me why a city needs its own ordinance to prohibit something that is already illegal under state law. But as a political strategy, at least, what is being reported (mostly) as the "decriminalization" of domestic violence in Topeka does leave something to be desired. According to one report, of the 423 misdemeanor cases prosecuted there last year about half were domestic-battery cases, and most of the rest involved shoplifting, drugs or assault. I assume they stopped prosecuting people for shoplifting or non-violent drug charges before giving the nod, even symbolically, to domestic violence. Anybody know?